With the building of a duck house, there had to be a duck pond to go with it. or, as it happened, two duck ponds. 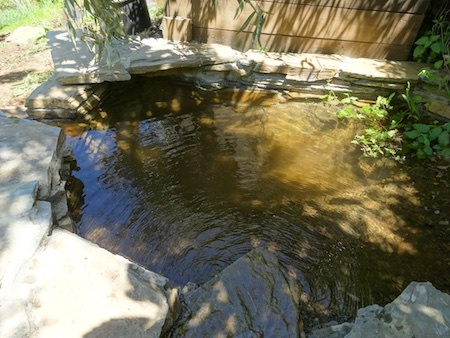 In addition to being ponds for ducks, these ponds also form part of the general water-retention strategy for the quinta. 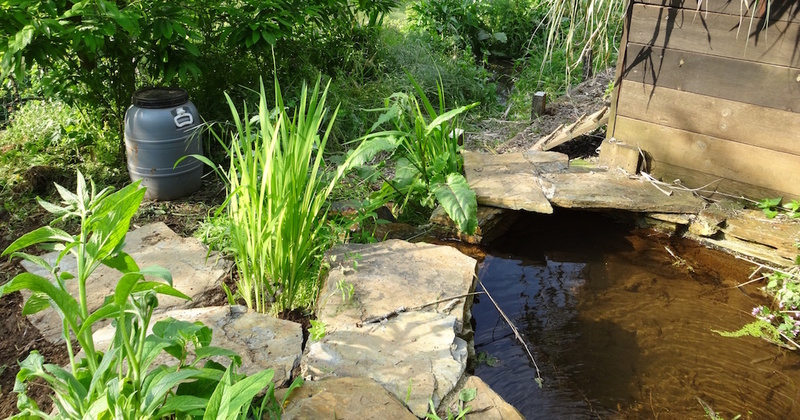 The aim is to slow the passage of water through this steep land and spread it as far as possible from the stream, allowing it to infiltrate and hydrate the soils. This promotes the growth of the vegetation which is so essential in improving the soils here. Vegetation decomposes to provide soil carbon. Without soil carbon, these thin soils haven’t a hope of holding onto moisture (or much of their biota) through the hot dry summer months. Irrigation becomes necessary. 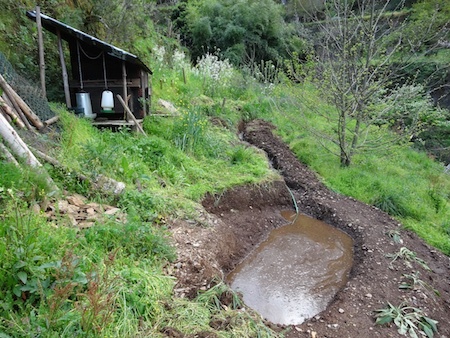 But build up soil carbon levels enough and eventually irrigation needs are minimal, even zero. So in order to make irrigation unnecessary, it’s initially necessary (at least if any kind of speed is required). Back to the duck ponds. Or maybe duck puddles would be more accurate. They’re barely large enough to be worthy of the word pond, though they’re more than adequate to keep a couple of ducks happy. 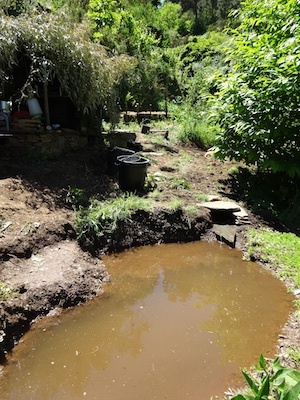 The ponds are an extension of the main swale which leads from the lower pond on the bottom terrace diagonally across the terrace to the wall at the back of the terrace right next to the hen house. The contour lines run diagonally across the terrace from edge to back, so so do the swales. 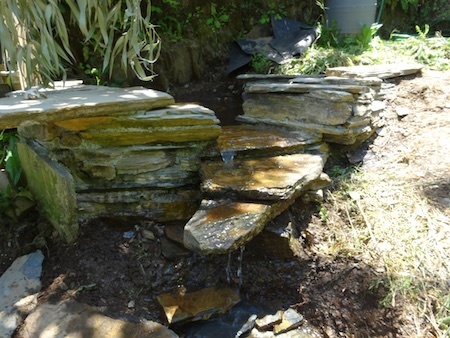 The first pond is at the point where the main swale meets the back terrace wall. 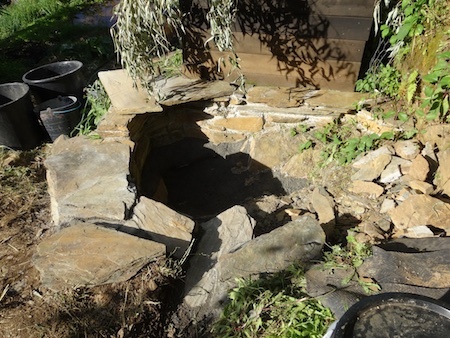 It acts as a collecting basin from which the water can then be dropped to a lower level, collected again in the second duck pond, and sent out in a further swale until it meets the back wall again. In theory I could carry on with this collect-drop-collect-extend model to the end of the terrace because the terraces are built to run gently downhill across their length, but an outcrop of bedrock and the increasing gradient of the terrace puts a stop to this not far beyond the second duck pond. 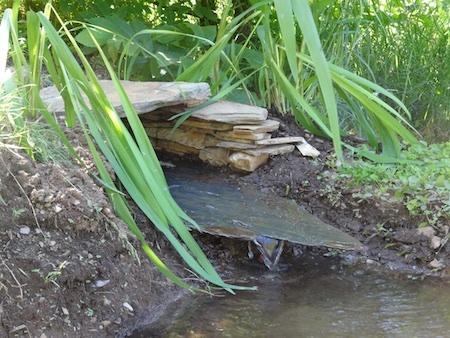 I used 110mm plastic waste pipe to take water from the spillway of the first pond to the inlet of the second. 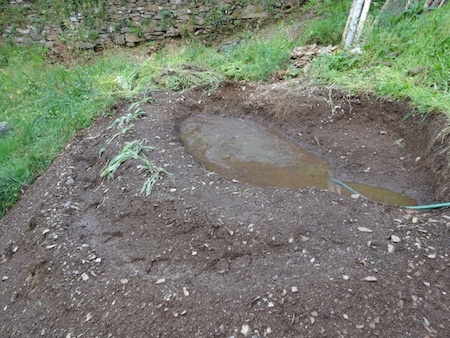 The second pond was dug in the ‘terrace’ created by the hens by scratching in their compound. 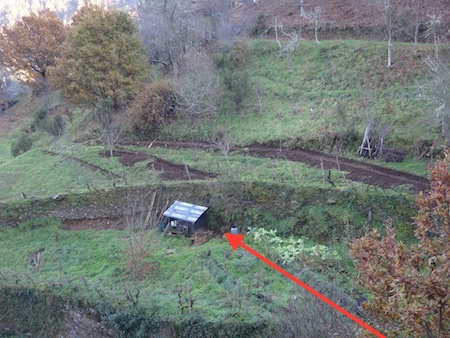 The soil which forms the dam is mostly well-manured soil from the old compound, so quickly grew a good covering of vegetation, including the comfrey planted here. Now all that remains is to install the electric poultry netting and thatch the hen and duck houses (this keeps the interior much cooler in summer) and we will be ready for a trip to market to recruit some user testers. I’m really looking forward to having poultry again. It’s been too long without.